The 59, 68, 91, 168 bus routes run between Euston Station (across the road from Friends House) and Russell Square. Travel subsidy: QCA will reimburse attending Members who have traveled from outside London to a maximum of £20 on presentation of receipts. This year’s AGM will be just 90 minutes to allow Friends to take full advantage of Yearly Meeting proceedings and events. Is it desirable, or even possible, for human beings to perceive themselves as equals with sentient, non-human beings, rather than as their natural superiors? Possible for us to regard animals, or particular species, as having the same sort of interest in their personal well being, the well being of their families and the integrity of this earth, our common home? What does love ask for us? 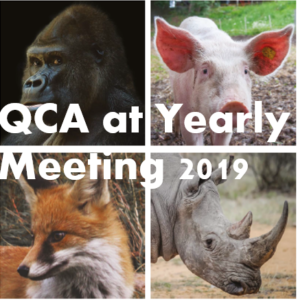 Dr Richard D. Ryder, the ethicist who introduced the word ‘speciesism’ in 1970; Quaker vegan Laura Wirtz and Quaker Concern for Animals member Julie Hinman will share with us their ideas and stories, followed by a facilitated discussion and questions from the audience.